There was something unusual about a tombstone passing through the Cincinnati/Northern Kentucky International Airport outside of Cincinnati, Ohio. For one, it was a tombstone being shipped by air. 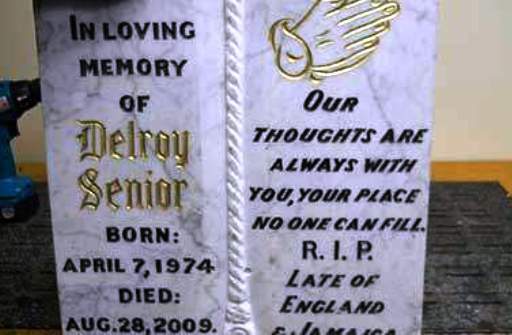 Secondly, it was in honor of Delroy Senior, no first name (or last name). Thirdly, he was late of Jamaica and England. As if that wasn’t suspicious enough, the concrete tombstone was painted to look like granite. A quick pass by of the drug dog revealed that the fake granite tombstone was stuffed with 52 pounds of marijuana. That’s a very good point. Man, drug smugglers will defile anything to move their product. No respect for the dead Delroy Senior, no respect for black velvet paintings of Jesus, and no respect for the sanctity of the airplane.